Miocic versus Cormier is a legitimate superfight and pits two indomitable champions still in their prime. With that said, there are plenty of other title fights worth paying attention to and it starts this coming February. We break down the UFC's next championship fights complete with betting odds and predictions. The undisputed middleweight champion Robert Whittaker got hurt so Yoel Romero stepped in to make this for the interim middleweight title. Odds reflect what could be the most competitive title fight on this list as both Rockhold and Romero are world-class athletes with the ability to finish fights almost anywhere. Rockhold should be the favourite here, however. The former UFC and Strikeforce champion eats wrestlers like Romero for breakfast. He has wins over grapplers like Jacare, Chris Weidman, and David Branch. Provided he tightens up on his boxing, he should edge Romero. Originally booked for December last year, Frankie Edgar had to pull out due to injury and we instead got a Holloway-Aldo rematch, which Holloway easily won. Edgar has beaten every guy in the division not named Aldo and presents a unique challenge to the featherweight champion who hasn't faced a wrestler quite like Edgar. Holloway is rightfully the decided favourite here. While Edgar is persistent and a tough out for any fighter, Holloway's striking and evolving MMA game is just too much. At 26, Holloway is still growing as a fighter and most importantly, he hasn't surrendered a takedown in his last ten fights. Holloway should roll. Fourth time's the charm? Ferguson and Nurmagomedov were scheduled three times in the past but injuries and weight cutting issues cancelled them. If this fight happens, the division will finally crown a true lightweight champion. Ferguson and Nurmagomedov also present two distinctly unique styles: a funky all-around striker in Ferguson going up against the unstoppable wrestler that is Nurmagomedov. Nurmagomedov is the rightful favourite. The Russian is the UFC's most dominant wrestler. It's obvious what he will do once the fight starts but it's nigh-impossible to stop him from doing it. Ferguson has slick Brazilian Jiu-Jitsu and can wrestle but he's in for the fight of his life against the Russian mauler. Former strawweight champion Joanna Jedrzejczyk opens as a favourite despite getting brutally knocked out in the first round the last time she fought new champion Rose Namajunas. Every fight is different and Jedrzejczyk still has the more extensive fighting experience than Namajunas but overcoming a first-round knockout loss is another thing. Namajunas is a solid underdog here and she'll prove that her win wasn't a fluke. She not only knocked Jedrzejczyk out but dropped her twice and was lighting her up on their feet. Jedrezczyk and her camp will make the right adjustments and will come with a different gameplan. But at these odds, it's best to side with the champion. This fight is to determine who the UFC's pound-for-pound king. Heavyweight champion Stipe Miocic broke the title defence record by dominating Francis Ngannou while on the same card, light heavyweight king Daniel Cormier ran through Volkan Oezdemir. Cormier doesn't sound ecstatic about having to fight Miocic but the fight is happening. It's rare to see Cormier as an underdog but the Division I wrestler has not fought at heavyweight in five years but he was undefeated with wins over former UFC champions in Josh Barnett and Frank Mir. 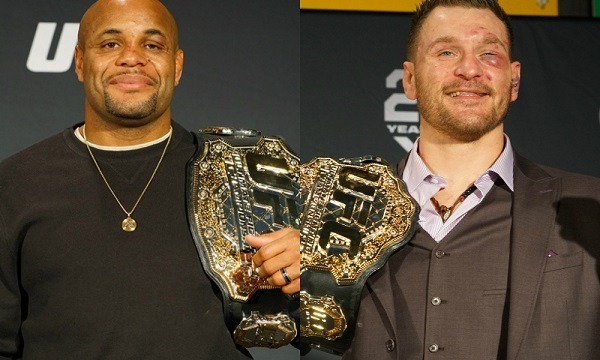 Cormier has the wrestling edge but Miocic is also a wrestler and a Golden Gloves boxing champion. The edge goes to Miocic but don't count DC out. Flyweight champion Demetrious Johnson versus bantamweight champion T.J. Dillashaw would be the UFC's baddest superfight if Miocic versus Cormier never happened. This fight could also determine the UFC's pound-for-pound kingpin since Johnson currently holds the top spot and Dillashaw shouldn't be too far away. Johnson has destroyed everyone he's faced and it's refreshing to see him matched up with someone who has been just as dominant if not more. Dillashaw's only loss was a controversial split decision to Dominick Cruz, who also holds a win over Johnson. When these two meet, expect the Fight of the Year. Canadians can turn to these online sportsbooks to get some UFC action on the side. Check our reviews to find the sportsbook that is right for you.